Good morning everyone. 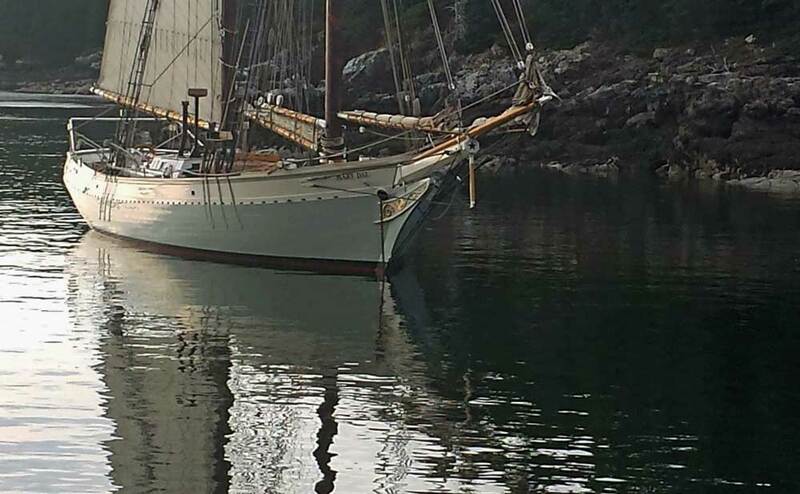 It is easy to get into routine patterns with any job even when one drives a schooner to work. 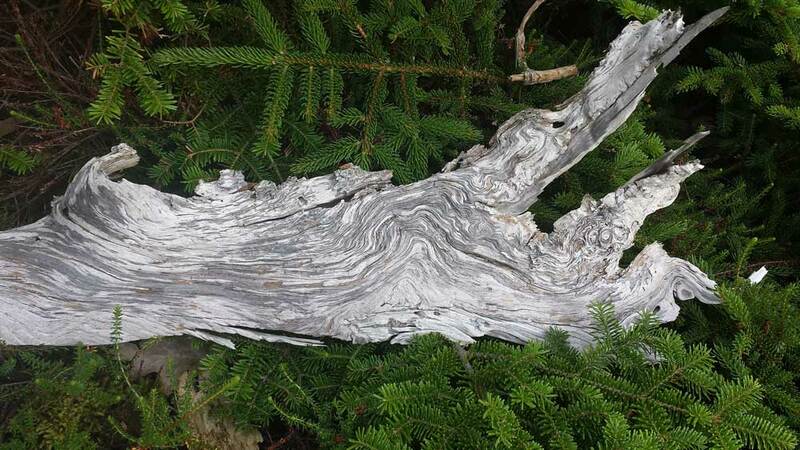 Not that all patterns are necessarily bad as you can see in this beautiful piece of driftwood. But there is nothing I enjoy more than trying to see each trip as a new adventure…which, by the way, it is. You would think that after 30 years of poking around the coast I would have seen most everything. Not yet! Breaking patterns is not always easy or even intentional but as these few photos may suggest it is well worth the effort. 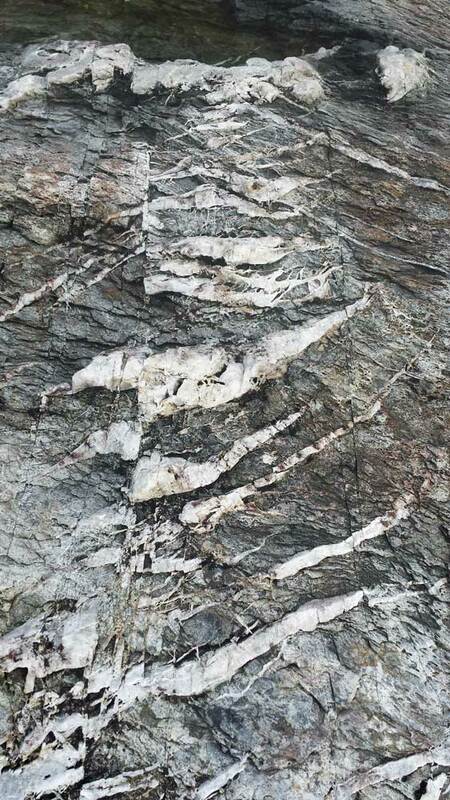 As you can see, even patterns in the rocks sometime experience abrupt changes. this island on a few occasions and to find a trail through the woods I never knew existed was a huge surprise and quite the bonus. Will wonders never cease! Posted in camden windjammer cruises sailing vacations on July 26, 2013 by Capt. Barry. Good morning everyone. There are some working vessels along the coast that turn heads. Double Eagle is one of them. 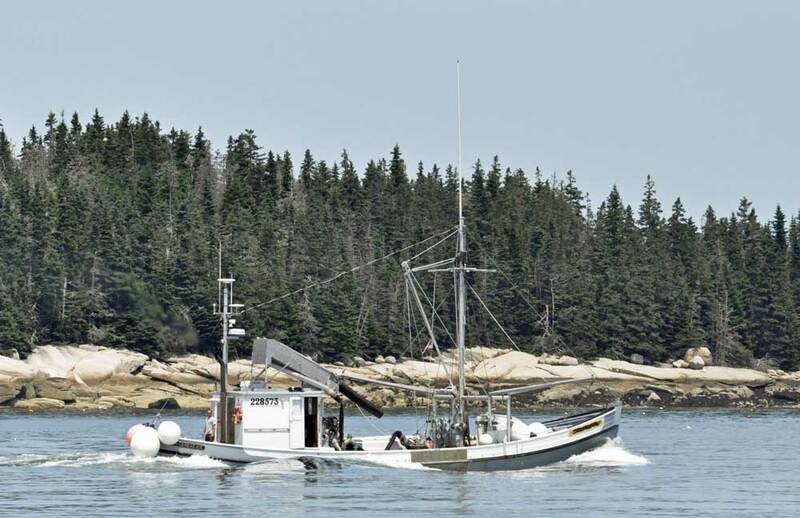 Loaded down with herring (I presume) and steaming hard to get fresh bait to the lobstermen Capt. Glen has her digging quite the hole with the power and grace that only a sardine carrier can pull off. Look at that wave along her side that stretches almost bow to stern. She is one of my favorites working boats out here. Posted in camden windjammer cruises sailing vacations on July 19, 2013 by Capt. Barry. Good morning everyone. The Maine coast is teeming with life these days. There is something about a beautiful day in mid-July that brings all creatures, great and small, to the surface to feed. There is so much going on that just getting out of Camden is an ordeal. We gave our usual security call before departing our berth. Evidently the captain of the sailing yacht “Prevail” hailing from Buzzards Bay doesn’t feel the need to communicate with the rest of the world maintaining radio incommunicado. While we frantically tried to stop the schooner from running up his quarterdeck he blithely cut in front of us and proceeded to start and stop in the channel oblivious to the VHF radio and a series of 5 rapid blasts of the horn (3X none the less!). Our days end was met with just the opposite, a yacht club rendezvous with 20+ boats from Boothbay hooting and hollering in what is normally one of the quietest anchorages along the Maine coast. The “intermission” between yesterday’s start and stop was filled with a very different kind of life. I can’t remember the last time I saw as much wildlife feeding as we did yesterday. Terns, puffins, auks, gannets and shearwaters were hovering and diving on small silver fish, herring I assume, where the swirling currents of Isle Au Haut Bay and Jericho Bay meet. By the hundreds, pelagic birds could be seen flying back to nearby Seal I with bits of silver in their beaks to feed hungry fledgling chicks. 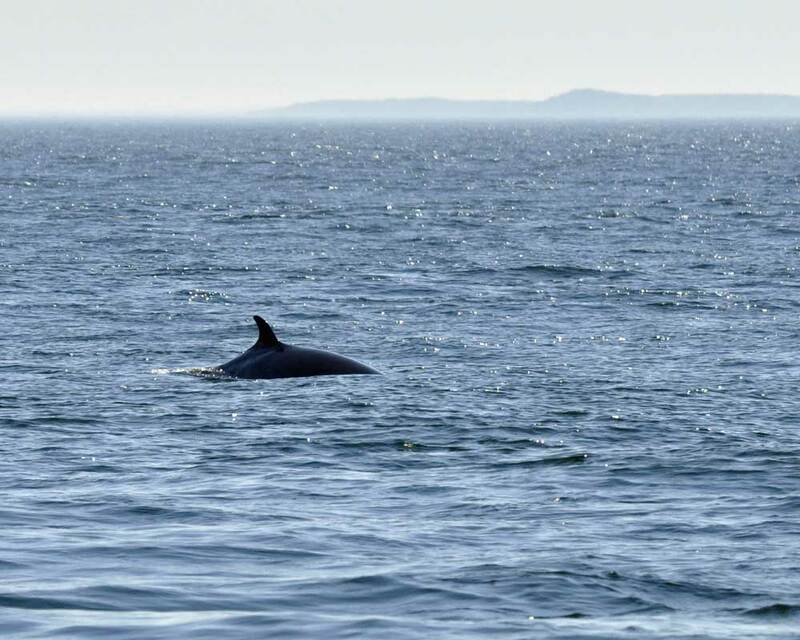 And as if that were not enough excitement we were all startled by the breath of surfacing minke whale just yards astern of us. And then this conversation dawned on me. Whale: Goodness it must be July…they are back. Humans gawking and picture taking. Paying no attention to where they are going. Disturbing the fish. Getting in the way of me swimming and feeding. Yeesh. 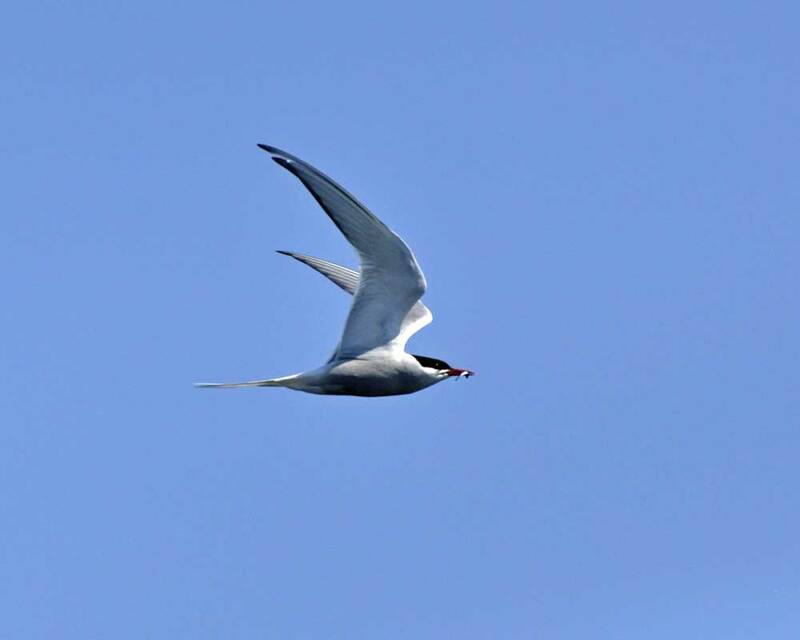 Tern: What. You never seen a bird with a fish in its beak before? Stop scaring the fish will ya! Me: Sorry folks. Your home is beautiful and we are just a little bit curious about your lives. We are in awe of what you might consider your everyday ordinary lives. By the way, what do you do during the winter? Posted in camden windjammer cruises sailing vacations and tagged camden windjammer cruises sailing vacations, maine coast seabirds, maine vacations, maine windjammer, schooner Mary Day, whale watching in Maine on July 16, 2013 by Capt. Barry. Good morning everyone and a very happy 4th of July to you all. We are anchored here in one of my favorite little hidey holes. From where we sit it would appear that the cool damp weather has moved offshore and that we are in for a couple of warm sunny days more typical of this time of year. Sunrise this morning was shrouded in a foggy mist diffusing the light as it peaked over Bowditch Mt in to our anchorage. 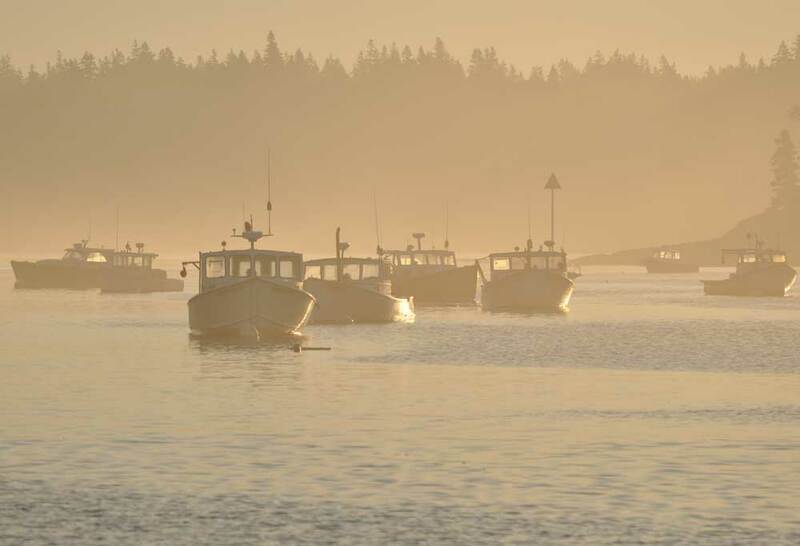 It is a fitting 4th of July reminder; working boats along the Maine coast bathed in golden sunlight. No different than a tractor in field of wheat waiting for another day’s work. Nothing can take away from the honesty created by wresting a living from land or sea. This “hands to work and hearts to God” approach to life is the single most important piece of America that I hold closest to my heart. Posted in camden windjammer cruises sailing vacations, Windjammer Cruises in Maine and tagged camden windjammer cruises sailing vacations, happy 4th of July, maine windjammer, windjammer sailing vacations, working craft along the maine coast, working waterfronts on July 4, 2013 by Capt. Barry.